Quiche is, as Thomas Keller called it, “the sexiest pie.” Photo by Donna Turner Ruhlman. I’ve been in LA on an entertainment project and to see the opening of my friend and collaborator Richard LaGravenese‘s new movie Beautiful Creatures. I’d never been to an opening before. But quiche has been on my mind, so I’ve been using travel time to work on some variations of this infinitely variable fat custard tart. If I had time I’d head to Bouchon in Beverly Hills, which makes perfect quiche. 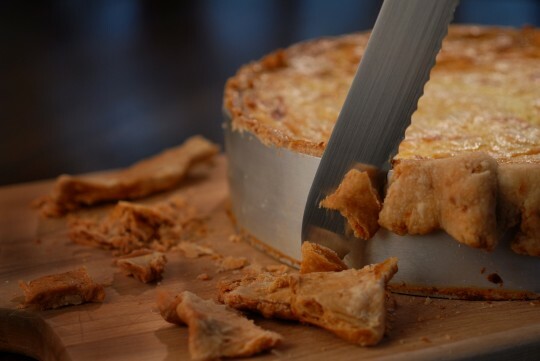 Bouchon, and working on that book, is where I learned that, while America was taught to make quiche in premade pie shells, this deprives the quiche of its true greatness: depth. In order to achieve that voluptuous texture, it has be about two inches thick. For this, you need to have a ring. When I told this to my partner in tools, Mac Dalton, he said, I can make that! I said great. And so we did. 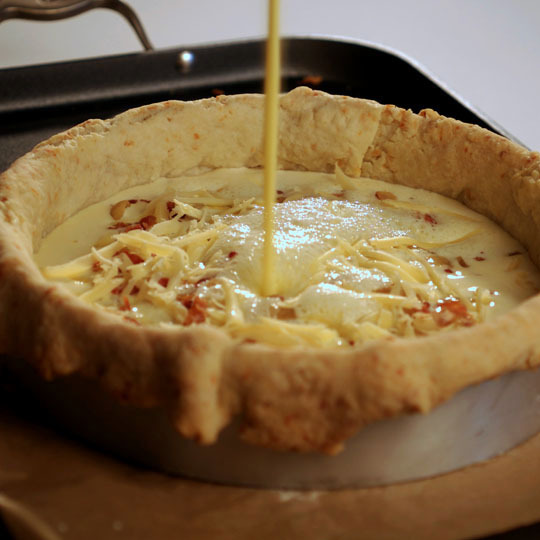 The recipe here is for my favorite quiche, simply bacon and onion enriched with delicious cheese. I made it for Kai Ryssdal when he interviewed me about my book Ratio. Trimming the crust off the quiche ring. Combine the flour and fat in a mixing bowl and rub the fat between your fingers until you have small beads of fat and plenty of pea-sized chunks. (If you’re making a bigger batch, this can be done in a standing mixer with a paddle attachment, but remember not to paddle too much after you add the water, just enough so that it comes together.) Add the ice water gradually and a good pinch of salt, and mix gently, just until combined—if you work the dough too hard it will become tough. Shape into two equal discs and refrigerate for 15 minutes or until ready to roll. Sauté the onions over medium heat in a few tablespoons of canola oil. You might cover them for the first 15 minutes to get them steaming and releasing their moisture, then uncover, reduce the heat to medium low, and continue cooking them until they are cooked down but not overly brown, 45 minutes to 1 hour. Set them aside when they’re finished. Preheat your oven to 350°F/177°C. Roll out the dough to a thickness of about 1/4 inch. Place a 2-x-9-inch ring mold or a 9-inch cake pan on a baking sheet (line the baking sheet with parchment if you’re using a ring mold; if you’re using a cake pan, line its bottom with parchment). Lightly oil the inside of your ring mold. Lay the dough into the mold—there should be plenty of dough overhanging the edges to help it maintain its shape. Reserve a small piece of dough to fill any cracks that might open in the dough as it bakes. Line the dough with parchment or foil and fill it with dried beans or pie weights so that the crust bakes flat. After a half hour, remove the weights and parchment or foil. Gently patch any cracks that may have formed with the reserved dough, and continue baking until the bottom of the crust is golden and cooked, about 15 more minutes. Remove it from the oven and patch any cracks that may have opened; this is especially important if you’re using a ring mold, or the batter will leak out. The shell should be anywhere between cold and warm when you add the batter, not piping hot from the oven. Reduce the oven temperature to 325°F/163°C. Sauté the bacon gently until it’s cooked as you like it (crisp on the outside, tender on the inside is best!). Drain the bacon and combine it with the onions. In a six- or eight-cup liquid measuring cup, combine the milk, cream, eggs, salt, pepper, and nutmeg and, using a hand blender, blend until frothy. This can be done in a standing blender as well (though depending on the size of your blender, you may need to do it in batches). Or you could even mix the batter in a large bowl using a whisk—beat the eggs first, then add the rest of the ingredients. The idea is to add the ingredients in two layers, using the froth to help keep the ingredients suspended. Layer half of the onion-bacon mixture into the shell. Pour half of the frothy custard over the mixture. Sprinkle with half of the cheese. Layer with the remaining onion-bacon mixture. Refroth the batter and pour the rest into the shell. Sprinkle the remaining cheese over the top. You may want to put the tray with the quiche shell into the oven and pour the remaining batter into it there so that you can get every bit of batter into the shell. You can even let it overflow to make sure it’s up to the very top. Bake for about an hour and a half, or until the center is just set (it may take as long as two hours, but don’t overcook it—there should still be some jiggle in the center). Allow the quiche to cool, then refrigerate it until it’s completely chilled, at least 8 hours or up to 3 days. Using a sharp knife, cut the top of the crust off along the rim. Slide the knife along the edge of the ring mold or cake pan to remove the quiche. Slice and serve cold or, to serve hot, slice and reheat for 10 minutes in a 375°F/190°C oven on lightly oiled parchment or foil. * Lardons are batons of bacon and can be as thick as 1/2-inch square. Smaller lardons are best here, but a pound of thick-cut bacon sliced into strips is also acceptable. This is the quiche “money shot”. My post on making your own English Muffins. 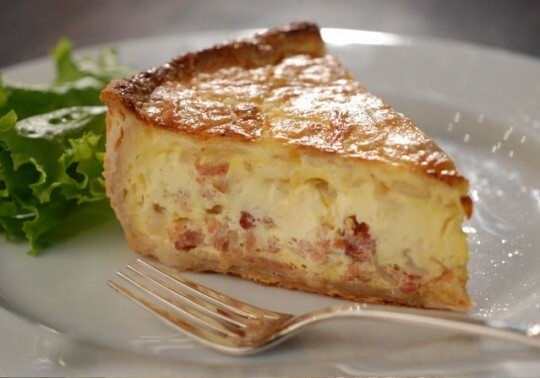 Learn about the history of quiche lorraine. Another great treat: try baking your own cinnamon bread. © 2013 Michael Ruhlman. Photo © 2013 Donna Turner Ruhlman. All rights reserved . I made a vegetarian quiche (mushroom, shallot, and Gruyere) a couple of years ago using your recipe for the crust. The 9″ ring mold is a bit of a unitasker, but it really is *so* much better than one made in a cake pan. Hmmm. Your link to “the history of quiche lorraine” says that “Some recipes call for shredded cheese—swiss, gruyère, or emmental. Again, these ingredients should never find their way into a true quiche Lorraine,”, instead it should contain just cream or creme fraiche with no milk involved. Yea, I found the link interesting. Like every recipe it is adapted, even quiche. Nice catch, thanks for sharing and for reading. I’ve made this a few times and always have issues with the crust. I’ve used beans and pie weights but seem to have bubbles and cracks. I’ve patched them but still have had leaks. Any tips/tricks for the first blind bake to get the best crust would be appreciated. The frothing thing is interesting. With all of that milk…not getting how such a fragile froth in what must be a fairly thin liquid could suspend heavy ingredients. Still, interesting. I’ve always gone out of my way to avoid froth in order to achieve a dense/silky custard. I’ve never used milk in quiche, just cream and creme fraiche. I’d love to see the final consistency of this product. I totally agree. Quiche is one of the tastiest pie inventions ever! Luckily I grew up with it and it still remains a dinner staple at our house. I own the Bouchon cookbook and bookmarked this recipe forever ago. My standard recipe is just a little easier, especially since I have it memorized. Great moody shot of the crust cutting. Would a springform pan work for this? I’ll admit, I haven’t made many quiches, but when I have I’ve just made them in pie plates, and they really do need more depth. I’m confused about the “3-2-1” pie crust — it’s a ratio that’s supposed to take the place of actual recipes, right? Then why do you need to post a recipe too? And if the amount of water is variable, then the 3:2:1 ratio doesn’t always work. Why have a ratio at all? Seems useless. I recently got what I assumed was a standard quiche pan with removable bottom–10 inches by 1 inch deep. Reading your book, you recommended a 2-inch deep pan. Is it worth keeping my pan, or should I try to find a different pan? I don’t understand why the crust doesn’t burn? You’re cooking it almost an hour/til brown, then an additional possibly 2 hours. Dough and I are not friends so that’s my biggest concern with attempting this. I really, really love quiche though and would love to do this. I’ve been using a recipe handed down to me 30 years ago by a neighbor who had moved to the states from France and I’ve never veered too far astray; this might be interesting to try but I have to admit…I love the crust component with the silky custard; so a standard pie plate it is for me; probably forever! I missed that interview – do you have a link to it? Funny, I just made a quiche yesterday and then happened on this blog. I rarely use more than a handful of mozzarella, always bacon, sometimes I add shrimp/scallops, and a sauteed veg – this time it was yellow pepper and green onion. My quiche is like some people’s soup – whatever is at hand, goes in.